“Herreth?” is the usual response when you mention to people in this part of the world that you are going to visit Jerez, the capital of sherry country. Sherry. Was there ever a wine more misunderstood and ill-served by its reputation? Nobody is quite sure when the town of Jerez de la Frontera was founded; though the nearby provincial capital of Cádiz dates back some 3000 years to the time of the Phoenicians. They were a trading people and it is likely that they established some sort of settlement nine miles inland from Cádiz where Jerez now stands. A clearer picture emerges in Roman times. By then the wine of the region was already prized and in the two millennia since it has survived invasion, plague, flood, war and political upheaval to emerge as the gem of the wine world we know today. The Romans were ousted by the Vandals, then came the Visigoths and in AD 711 they were overthrown by the Moors who swept across the peninsula in a matter of years and remained for centuries. Their influence was enormous and their legacy remains today, most impressively in the Alcazar of Jerez. This sprawling complex dates from the 12th century and still contains the only mosque remaining from the 18 that Jerez once boasted. Soon after the fall of the Moors a period of sustained British influence began, sometimes bellicose, sometimes benign. In 1587 Sir Martin Frobisher, one of Sir Francis Drake’s captains, famously ”singed the king of Spain’s beard”, setting fire to the Spanish fleet in Cádiz harbour and making off with about 3,000 barrels of wine. From such violent beginnings emerged a boom in sherry sales that surged across the centuries that followed. By the time of the Peninsular War some 200 years ago many of the leading names in the business had been established: Garvey, Hidalogo-La Gitana, Osborne, Domecq, Sanchez Romate, Sandeman and others. The war, however, wreaked havoc on the region, with thirsty troops from both sides helping themselves again and again to the readily available wine. Despite its traumatic beginning the 19th century brought great prosperity to the region, with sherry establishing itself as the fashionable drink in markets right across the globe. This was thanks, in part, to its ability to withstand long sea voyages as a result of being fortified. As the sherry flowed out the wealth flowed back and the merchants were able to build themselves splendid mansions surrounded by manicured gardens. The most impressive of these was built by a Frenchman, Julian Pemartin, and designed by Charles Garnier who was also responsible for the Opera House in Paris. It still stands and is now incorporated into the Real Escuela Andaluza del Arte Ecuestre where it manages to look imposing and delightfully out of place at the same time. A more prosaic yet no less impressive reminder of the wealth generated by the trade is the collection of cathedral-like bodegas belonging to the major shippers. The walls of brilliant white are bordered in ochre while the doors are resplendent in darkest green – a restrained and regal combination. Inside, they are remarkably cool and it takes a while to adjust to the dim light and sepulchral hush. Time, if it could stand still, would surely do so here. Vast ranks of blackened barrels recede into the distance in every direction. There is a faint whiff of wine, wood and earth. Your footfall is softly absorbed by the sandy floor while your words disappear into the dark with nary a whisper of an echo coming back. 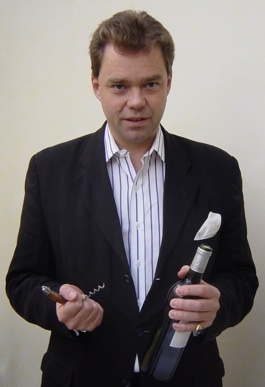 The cellar master stands ready with his venencia, a slim metal cup with a long flexible handle attached. He plunges it deftly into a selected barrel, through the coating of flor on top of the wine, disturbing it as little as possible, and extracts a sample. This is then poured with dextrous ease and from a great height into your glass. You immediately ask him to repeat the process so that you can get a photograph. Tourist duty done, you turn your attention to your glass. The wine from barrel is cool and fresh, pale as bleached lime, dry as chalk and possesses a savoury tang that runs through it like quicksilver. It is this savoury note that gives sherry its identity. It flows in torrents through all finos, positively cascades through manzanillas and slows to a subdued trickle through the deep amber of a fine amontillado or the dark mahogany of a noble old oloroso. But it is always there, refreshing and invigorating as it goes. Such matching is everywhere to be seen in the tapas bars of the region. One of the best is the Casa Bigote in Sanlúcar. At lunchtime it is crowded and bustling and it appears that the whole town has tried to squeeze into the small space. Everybody is standing, from pensioners to toddlers, and the staff behind the shining metal counter dart back and forth with barely a pause to take or deliver an order. Dishes, plates, glasses and bottles clatter on the counter, fighting for space with the chalked-up bills that are written directly onto the metal surface. In the rush a glass is knocked over, the crowd parts temporarily but no damage is done, even the bill survives! The gap closes and it’s back to the serious business of choosing which manzanilla to have. Will it be La Goya, or La Gitana or La Guita? The visitor is treated to a sample of all three to let him know that while Jerez might hog all the limelight he hasn’t tasted anything until he has tasted manzanilla. Across a laneway in the restaurant proper the most splendid array of seafood is on offer. A quartet of dishes – prawns, tuna, red mullet and cod in a tomato and Seville orange sauce – comes in quick succession. The last is a revelation: tender and moist with just the right amount of ‘lift’ provided by the sauce. With the food taking centre stage the background music is provided by the manzanilla and it effortlessly matches the twists and turns of flavour from dish to dish. An even bigger test for the versatility of sherry is provided when meat is added into the equation such as at the splendid Venta la Duquesa restaurant near Medina Sidonia. Iberico ham… tomatoes in oil and garlic… wild rabbit liver… stalks of chard with poached egg… baby goat cutlets. The fino may not have been the perfect foil to all of these dishes but there isn’t another wine in the world that could come close. Lunch lasts late into the afternoon. A more structured approach to food and wine matching can be found at the excellent El Faro de El Puerto restaurant, probably the best in the region. Founded by Fernando Córdoba in 1988 it raises Andalusian cuisine to new heights. The smoked eel is a wonder, the tuna ceviche not far behind and the anchovy with trout roe and goat’s cheese on toast is superlative. 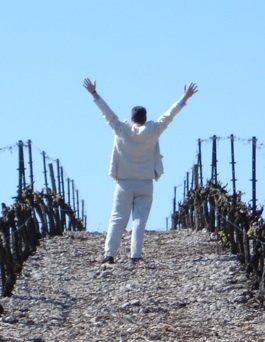 If you want to go on a voyage of culinary and vinous exploration let Fernando do all the choosing for you, both food and wine, and you won’t be disappointed. He is happy to talk about his cooking but in truth his dishes are the most eloquent statements of his philosophy. Balance and harmony and a superb understanding of how the separate ingredients will work together are their hallmarks. Strawberries and salt anyone? Blended together they make a wonderful base for a gazpacho like no other. Some of the region’s culinary delights can be found at a more humble but no less satisfying level. After a January morning visit to the food market in central Jerez, where the meat and fruit and vegetables are mere bit part players alongside the seafood, a bag of churros is called for. This is a thick batter, deep fried to order in a spiral shape, and lightly dusted with sugar. It is impossibly addictive and with a cup of coffee provides the perfect insulation against the cold. Sherry is a fortified wine, meaning that it has brandy added to it to increase its alcoholic content to certain pre-determined levels. Almost all sherry is made from the palomino grape which, left to its own devices, produces a humble wine of no great distinction. 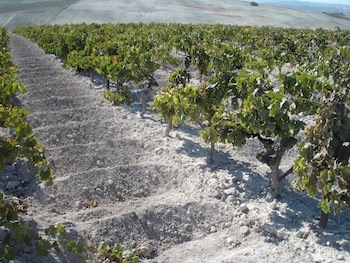 When grown on the pale grey albariza soil of the region, however, and then subjected to the wonderful sorcery that is the solera system, it is elevated into one of the world’s most distinctive and unique wine styles. After fermentation the wines are tasted and graded. The finer ones are fortified to about 15 per cent alcohol and the more robust to about 18 per cent. The lower alcohol level permits the growth of flor, a scum-like yeast that sits on top of the wine and feeds on it while protecting it from oxidation. Thus the wine ages in a biological fashion and is called fino. At the higher alcohol level the flor cannot develop and the wine ages in an oxidative fashion, getting darker with the passage of time. This is oloroso. All of the wines pass through the solera system; a process of fractional blending that ensures consistency in the house style from year to year. Very simply this consists of tiers of barrels, each tier holding a slightly different blend of the same wine. The oldest wine is in the bottom tier or solera (from the Spanish word suelo for floor) and as wine is drawn for bottling from this, the deficit is made up from the next oldest above it. It in turn is replenished from the next oldest and so on. Finally, the newly made wine is used to top up the youngest barrels. 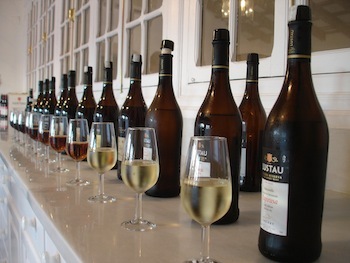 Fino (or manzanilla in Sanlúcar) and oloroso are the two principal styles of sherry. Lying between them is amontillado, which starts out life ageing like a fino but then, with the disappearance of the flor, gets closer to an oloroso in style. 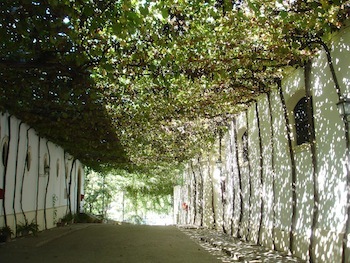 There are numerous other sub-styles but these three cover the bulk of all sherry produced. All styles are dry and may be sweetened with the addition of some wine made from the pedro ximinez grape. Finos are light and delicate with a refreshing tang. Amontillados have greater concentration and depth while olorosos are intense and nutty with great length of flavour. Article originally published in Spain Gourmetour magazine, 2006.